If you would like to receive occasional email updates about new releases, upcoming concerts, workshops, and news about the West Coast Guitar Night please email the address below to be added to the email list. 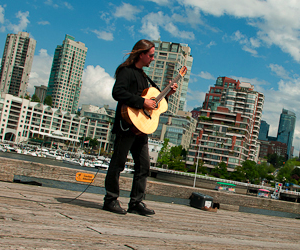 Vancouver guitarist Les Finnigan has provided original live acoustic guitar music for all sorts of events since 1995. If you would like a quote, please include the location, date, and time of your event and the length of set that is required. Click here to see the VENUE AND EVENTS LIST. If you are interested in licensing Les Finnigan’s music for an audio/video project please use the email address below and include detailed information about the subject matter and what images the music will be synchronized with. Music books with notation and tablature are now available for Counterpoint Conundrum, Out in the Wild, The Brave Dog, The Fiery Cart, All Over the Map, Steel String Portraits, and Stories Without Words. Things My Guitar Said will be available soon. The price is $20 per book (plus shipping). Please email for mail order details or save the price of shipping and pick one up at any live performance. Les is an independent composer, guitarist, recording engineer, performer and promoter. This keeps him more than busy and therefor he does not do other musical projects or private lessons, but you may catch him doing an occasional guitar workshop in Vancouver. © Les Finnigan. Web design Mercury Graphics Ltd.